We envision a community that affords every child the best start in life. That’s why we’re actively engaged—through policy development, advocacy, evaluation, and program piloting—in creating a Minnesota that supports optimal child care and early learning. For policymakers, funders, government agencies, non-profit organizations, and others concerned with kids, we’re a bold and effective partner. We invite you to work together with us on community and state-wide issues involving early childhood. We are proud to stand alongside these great organizations in support of H.F.1—The Great Start for All Minnesota Children Act. 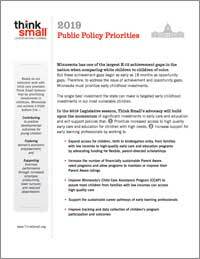 When it comes to addressing Minnesota’s severe opportunity gaps, we know starting early is effective. In fact, the single best investment the state can make is targeted early childhood investments in our most vulnerable children. We have made great progress in early education in Minnesota. However, many children still do not have access to high-quality care. Children who enter kindergarten unprepared are less likely to achieve third grade reading standards, less likely to graduate high school, and less likely to ever attend college. They are more likely to drop out of school and more likely to be arrested for a violent crime. 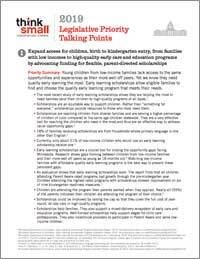 You can use the resources below to talk with others about the need for high-quality child care in Minnesota. When all Minnesota kids have the best possible start, we’re all better off. Our goal is to ensure all children of color and American Indian children and their families have the opportunity to thrive and live theirfullest lives. 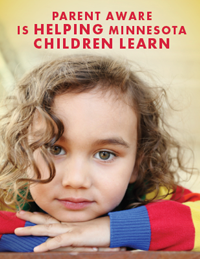 Minnesota children are nurtured, healthy, eager to learn and prepared to succeed in school and in life.